After decades of work as an engineering contractor, Westlake Village's Timothy J. Ferrie found himself embarking on a second career in design. Nearly a decade later, his Lightsculptures are gaining fans the world over. For nearly a decade, Timothy J. Ferrie sculptural lighting elements have been gaining fans the world over, charmed by his pieces' unique mix of ingenuity, function and elegance. Called Lightsculptures, Ferrie's work serve as both works of art and pieces of décor, ranging from elaborate chandeliers to wall sconces and floor lamps. 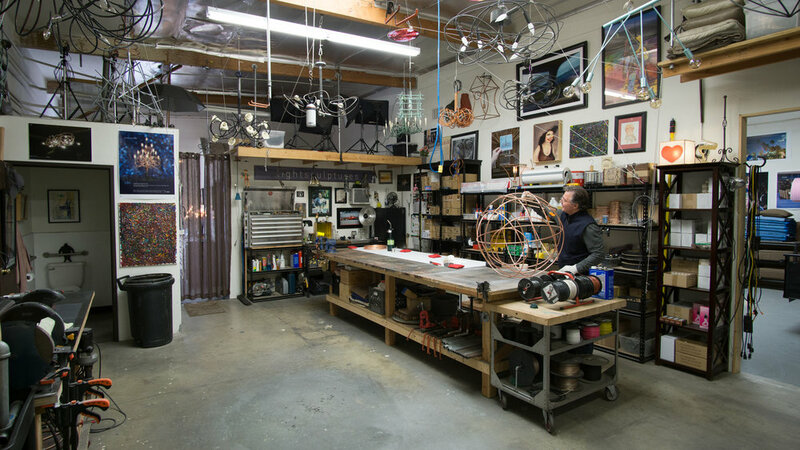 Before turning his energies towards Lightsculptures, Ferrie, a Westlake Village local, was an engineering contractor for 26 years. In 2009, he and his girlfriend were remodeling their kitchen when they ran into difficulty finding a fixture that fit their aesthetic. Ferrie decided he would try his hand at fabricating something from scratch. Because of his engineering background Ferrie was familiar with the malleability of copper tubing, and ultimately created a beautiful lighting element from the material. “When people saw it they would ask where we got it, and the idea for Lightsculptures started there,” Ferrie said. Soon Ferrie was selling his pieces to homeowners and designers, and Lightsculptuers were being featured in some of the most beautiful properties in the area. Ferrie’s designs can be found in the Tasting Room at the Four Seasons Westlake Village and the Stonehaus Winery at the Westlake Village Inn, as well as San Diego’s trendy La Pensione Hotel. Ferrie’s pieces were also featured in the 2015 Met Loft Apartment at the Dwell on Design Show in Los Angeles.